Holabird & Root's recent design of the Northwestern University School of Law Atrium Addition has been named a Silver Award Winner by the Association of Licensed Architects through their 2015 Design Awards Program. Our firm is honored to have won this esteemed award and we are indebted to Northwestern University Law School for thier continued partnership. Founded in 1859, Northwestern University School of Law advances the understanding of law and produces graduates prepared to excel in a rapidly changing world. Northwestern Law uniquely blends a rigorous intellectual environment with a collegial and supportive community. 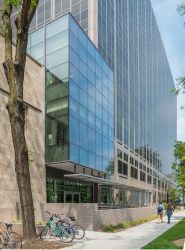 Holabird & Root has continued its long-standing relationship with this prestigious Chicago School of Law by most recently being given the opportunity to provide programming and an addition and renovation to its atrium, which was completed this past spring. The three-story atrium addition boasts a new two-story space adjacent to the expanded café, utilized as multi-purpose space for student study, events, and collaboration. New state-of-the art flip classrooms and student study areas are both open and private to foster interaction among law students. The area of new construction was 4,941-s.f., with additional renovation of 15,600-s.f. to existing adjacent floors and a mechanical penthouse. The program includes a revamped café that solves the circulation, queuing, and storage capacity problems of the existing arrangement, and lounge seating area with direct access to a new outdoor terrace, new classroom space, shared student study rooms, and open study tables with lounge seating. The renovated spaces included a faculty office suite, library circulation and reference desk, and additional study space. The double-height seating area occupies a space physically separate from the cafe so the seating can be used for lectures, meetings, and other similar events even when the café is not in operation. The second floor provides a critical connection between the two main existing structures near the south face of the new addition that creates a continuous circulation loop through the campus. This connection traverses enclosed group study areas and a series of study balconies overlooking the café seating below. The third floor also connects to the existing library and adds group study rooms to the existing program. H&R originally designed the 360,000-s.f. facility, which houses a major addition to the Law School, including its library. The 1,000 sf site for the new addition is located between the McCormick Building, a 1950’s Holabird & Root Project, and the Rubloff building which was designed by Holabird & Root in the 1980’s. The new structure was tied to the Rubloff building’s steel frame, but was designed to float independently from The McCormick building’s limestone-concrete and wood-pile structure despite a new, continuous circulation loop that links the three structures at the second floor. The floor levels and floor-to-floor heights do not align between Rubloff and McCormick, and so the atrium expansion also needed to navigate these elevation changes. Finally, The existing, recessed atrium space created a break between the Limestone façade of McCormick and the glass, steel, and granite façade of Rubloff which the new project would infill. The response was to project the second and third floors of our addition beyond the neighboring facades to maintain the break in plane and to extend a new, granite terrace space and steel canopy from beneath the addition’s projecting façade, which wraps the adjacent Rubloff façade. While we removed all of the Rubloff façade within the volume of our new addition we were able to maintain and expose the existing limestone wall of McCormick as a feature of the new lounge and classroom spaces. The new addition is a steel-framed structure with a structurally glazed, triple-pane glass and aluminum curtain wall, and a granite material palette. The interior space features extensive millwork, felt wallcoverings, carpet, and terrazzo floors. As part of the project the air handling equipment in the McCormick building penthouse was replaced with new, more efficient equipment which serves not only the new addition, but the surrounding historical structures as well. From the exterior, the new atrium addition extends south toward the street. This, in-conjunction with the abundant use of glass, provides the Law School with an iconic presence to those passing by the building. Occupants within the space are provided with panoramic views to nearby Lake Michigan and the city. With the inclusion of an outdoor terrace directly adjacent to the café, the City of Chicago serves as an extension of the classroom, providing NU Law students with a connection to the lake and everything the City has to offer. The resulting design provided the University with a number of new spaces for modern Law instruction, enhanced the productivity and satisfaction of occupants, further enriched the collaborative atmosphere sought by Law students, and created a new image for the institution. Holabird & Root team members on this project include Project Designer Rusty Walker, Project Manager Jan Behounek, Project Architect Cory Kamholz, Project Coordinator Max Hanisch, Principal in Charge Jim Miller, Graphic Designer Hye-Yeon Cho, Senior Interior Designer Andrea Caputo, and Interior Designer Erin Masters, with contractor services provided by Norcon, Inc. The Association of Licensed Architects (ALA) is an organization open to all architects and professions related to architecture. It represents architects registered or licensed in any state, territory or possession of the United States or foreign country. The ALA Design Awards Program is an annual showcase of the power of design by members. Winners are highlighted in the Winter issue of Licensed Architect magazine. Images courtesy of John Steinkamp Photography.